The Bahamas International Securities Exchange (BISX) has announced that Royal Fidelity Capital Markets a BISX broker-dealer member has submitted an application to list three series of the Royal Fidelity Bahamas Opportunities Fund Ltd mutual fund on BISX, using the exchange's mutual fund listing facility. This fund was approved for listing by the BISX Listing Committee and will now have its information disseminated via the BISX website. 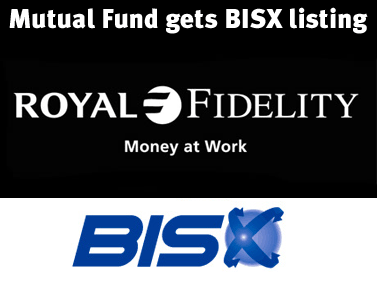 The Bahamas International Securities Exchange (BISX) is pleased to announce that Royal Fidelity Capital Markets a BISX Broker-Dealer Member has submitted an application to list three series of the Royal Fidelity Bahamas Opportunities Fund Limited mutual fund on BISX, using the Exchange’s mutual fund listing facility. This fund was approved for listing by the BISX Listing Committee and will now have its information disseminated via the BISX Website. The Royal Fidelity Bahamas Opportunities Fund (the umbrella fund) is an umbrella fund created to market separate mutual fund sub-funds to different types of investors through the use of different series. The umbrella fund offers three sub-funds, each sub-fund has three series, and each sub-fund will list the series that serves retail investors. The three retail series to be listed will have their Net Asset Value and other information disseminated by BISX. • Royal Fidelity Targeted Equity Fund (Class A, Series 1 Shares) seeks a high total return on investment through investments in Bahamian Dollar equity securities, money market instruments or investment funds. This series takes the place of the Royal Fidelity Growth and Income Fund a stand-alone mutual fund previously listed on BISX. • Royal Fidelity Secure Balanced Fund (Class B, Series 1 Shares) seeks to provide investors with the long-term growth potential of local equities coupled with a steady rate of fixed return and preservation of capital through allocation to local fixed income securities. The Fund will attempt to achieve this objective primarily through a balanced allocation to the equity portfolio of Targeted Equity Trading Company Limited and the fixed income portfolio of Prime Income Trading Company Limited. • Royal Fidelity Prime Income Fund (Class C, Series 1 Shares) seeks a high and stable rate of return in excess of the Benchmark, together with long-term preservation of capital. The Investment Manger will be responsible for managing the assets of the portfolio on a daily basis. This series takes the place of the Royal Fidelity Prime Income Fund a stand-alone mutual fund previously listed on BISX. The Investment Manager of these mutual funds is Royal Fidelity Merchant Bank & Trust Limited, Royal Fidelity Merchant Bank & Trust also serves as administrator for these funds. Download: Trading Notice – Royal Fidelity Bahamas Opportunities Fund. ZNS Network news is running segments that focus on the 2013/2014 Budget Communication, highlighting key areas of expenditure and revenue generating initiatives. Watch the first segment here.